Professor Nagel combines an active concert and teaching schedule and is noted for his lecture-recitals by musicians and non-musicians alike. He has performed in highly acclaimed solo recitals and concerto concerts in major American and European cities. He has taught at the Interlochen Arts Camp, International Music Camp in Poland, Adamant Music School, and the Amalfi Coast Music Festival in Italy. He is director of the School of Music, Theatre & Dance Outreach Program at U-M and advisor to the Bachelor of Musical Arts Degree program. Professor Nagel is a sought-after presenter at state and national conferences with lecture-recitals at National Music Teachers’ Association conventions in Dallas, Washington D.C. and Salt Lake City. He is often invited as a state convention artist and has appeared in other forums in throughout the United States. He is on the board of the American Liszt Society and often performs at its annual festivals including the Great Romantics Festival at McMaster University. He has presented programs in association with the Michigan Psychoanalytic Institute at both the state and national levels, in collaboration with his wife, the psychologist and musician, Dr. Julie Jaffee Nagel. 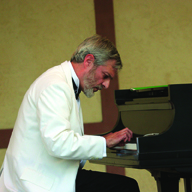 Professor Nagel is a Steinway artist, and has performed in Steinway Hall in New York as well as numerous times for the Steinway music stores in Michigan. Professor Nagel has studied with Rosina Lhevinne, Josef Raieff, Joseph Bloch and Vladimir Ashkenazy. His CD, Four Centuries Of J.S.Bach, has been praised by Murray Perahia and David Dubal. He is often invited to perform and lecture in David Dubal’s Piano Literature classes at The Juilliard School. Professor Nagel has appeared with the Cedar Rapids/Waterloo Symphony and Southern Great Lakes Orchestra. He is currently presenting a series of programs traversing the complete works of Beethoven for piano, violin and cello at Ann Arbor’s Kerrytown Concert house in collaboration with colleagues Steven Shipps and Anthony Elliott.